One of the easiest of all of the succulents to grow Aeonium arboreum can reach over 1 metre in height with multiple stems, and a mature specimen creates a great sculptural plant. Native to the Canary Islands and areas around the Mediterranean this is a large growing succulent that can form small shrub over time. It can also be kept small, a single stem and single rosette by simple pruning techniques. 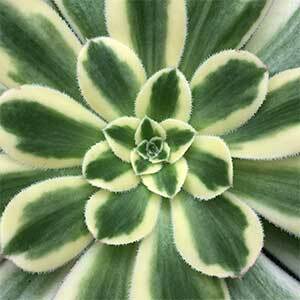 The foliage is green, held in a large round rosette, flowers are a clear yellow and will appear from winter to spring. Flowers appear on individual stems as the plant ages, after flowering that stem will die back, however the rest of the plant survives. 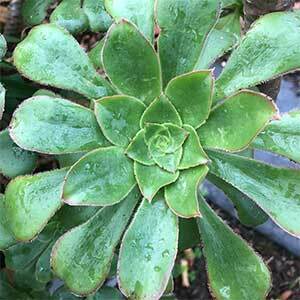 Grow Aeonium arboreum outdoors in a sunny to part shaded position either in the ground or in a container. You can also grow it indoors however good light is required. This is an Aeonium species that has more to offer, many cultivars are available, foliage varies greatly and well known darker varieties include Aeonium arboreum atropurpureum and Velour. These are excellent foliage plants for growing in containers or in the garden. Attractive foliage year round, as well as flowers in spring. As long as the growing medium is free draining, and the plant receives good light this is an easy and reliable plant to grow. Outdoors you will not need to water the plant unless you have a long dry period. Indoors, a little water once a month is usually sufficient. Never let the soil stay wet, and always allow the soil to dry between watering. Fertiliser is generally only required in spring when you can use a little slow release general purpose fertiliser. Although these are a hardy plant, they will perform a little better with some basic care. If grown outdoors in harsh conditions the foliage may not lookouts best. Find a sunny sheltered position, They are best in a position where they get good natural airflow, this lowers humidity and prevents fungal diseases. Use a good quality free draining potting mix. A large container will be needed eventually as these plants do form stems. Over a few years that can become to top heavy for small containers. Be careful with watering, although they do not like to be overwater, they do appreciate a little more water than some other Aeoniums. As the plant becomes tall you may wish to shorten it, simply cut off the rosette with around 30 cms of stem and replant it. The only other pruning required will be the removal of the old flowering stems, which will die anyway. Propagation is from seeds, stem cuttings as well as leaf cuttings. ‘Zwartkop’ (schwarzkopf) – Deep purple, almost black foliage. Aeonium arboreum var. atropurpureum forma cristata. – A crested form. 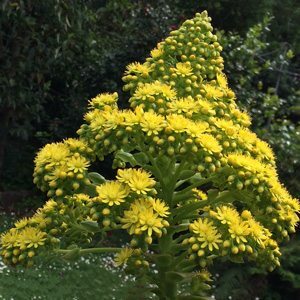 Common Names – Tree Aeonium. Position – Brighter filtered light to full sun, foliage colour will vary depending on the amount of light. Spread – Will spread to .5 metres over time. Foliage – Green through to deep red and yellow, some with variegation.